Our cottages can accommodate up to four people and are equipped with full kitchens, Direct TV and WiFi (limited). The decks overlook the second green and feature gas grills for barbecuing. Our Executive Suite includes a king size bed, a fireplace, mini-kitchen, (refrigerator, micro-wave, toaster oven, coffee pot, dishes, etc.) Direct TV, WiFi (limited), all at very competitive rates. If you are guests in our Cottages you'll receive a 50% discount on Greens Fees and Rental Clubs during your stay. Our nine-hole course has variations on both tees and greens which creates a considerable difference from the front and back nines. The course was designed by Thomas R. Smith in 1973. 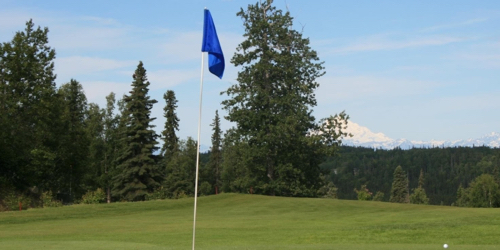 It is rated by Golf Digests "Places to Play" as one of the finest nine holes in Alaska. Now owned by Pat and Myrna Cowan and managed by their grandson, Zac Cowan, the atmosphere has been maintained as a very family friendly place. Birch Ridge Golf Course reserves the right to change price and offer at anytime. Prices and offer are subject to change without notice. GolfAlaska.com is not responsible for errors posted in this golf package.